The Council’s board and leading benefactors have committed over two-thirds of goal to this effort. Many of these gifts are in the form of multi-year pledges. CFR is now turning to its other distinguished members to complete the Campaign. 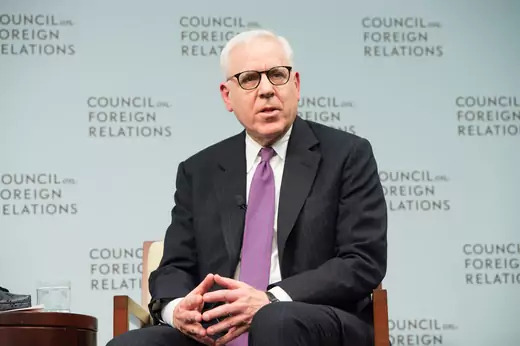 “I believe this is a unique opportunity for our members to help secure the organization’s long-term financial health so that CFR is equipped to meet future challenges with the resources required to sustain its excellence and leadership in the field,” Rubenstein said. ...we are seeking to expand the Council’s contributions to the field of foreign policy as we secure our second century. New funds will support the expansion of CFR’s intellectual agenda, allowing the organization the flexibility to invest in emerging issues such as cybersecurity, energy and climate change, and global health, as well as to institutionalize highly successful programs on the Council’s research agenda, such as the Renewing America initiative and the International Institutions and Global Governance program. ...the Council’s fierce nonpartisanship, seriousness of purpose, and levelheaded analysis are more important than ever. Campaign gifts will also help increase CFR’s impact by enabling further investments in our various outreach initiatives to nontraditional constituencies such as students and educators, religious communities, members of Congress and their staff, state and local government officials, and young professionals, as well as talent-development programs including international affairs fellowships and military fellowships that help prepare the next generation of national security leaders. Finally, gifts to the Campaign will secure CFR’s strengths by enabling the organization to reinvest in some of the most distinctive aspects of its work. This includes sustaining the Council’s tradition of nonpartisanship and intellectual independence, enriching the member experience, modernizing the Council’s information technology infrastructure, and protecting our websites and internal systems from cyberattacks. Annual giving, now covering more than 14 percent of the CFR operating budget each year, remains an institutional priority throughout the Campaign effort. Gifts to the Campaign are made in addition to support of the Annual Fund.